July 1969. Apollo 11’s astronauts will walk on the moon – and a huge satellite dish outside a sheep-farming Australian town has been chosen to beam the live footage globally. The whole world is depending on scientist Cliff Buxton (Sam Neill – Jurassic Park), who must steer the telescope’s eccentric crew through a sea of mishaps and disasters that threaten to spoil the small town’s finest hour. Watching over them is a by-the-book NASA representative who can’t quite understand their quirky working methods. A comical culture clash erupts in this effortlessly funny tale of how history’s biggest televised event was almost cancelled. 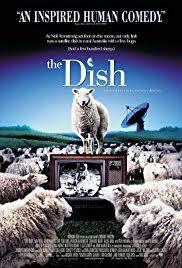 The Dish is a warm-hearted and hilarious comedy based on a true story of what the world didn’t see. We will be joined by members of the Flamsteed Astronomy Society who will display some astronomy photographs and a telescope. The film itself will start around 7.30pm (when it starts to get dark enough) and the cafe will be open for drinks and snacks. Indoors screening if weather is poor.